It was a festive afternoon at the 2016 Primitive Hall Christmas Reception! 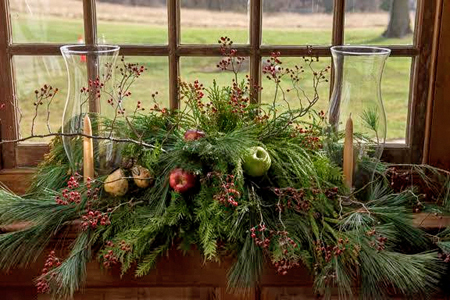 Neighbors and friends gathered at the Hall to bask in the beauty of this historic homestead as they shopped for holiday gifts, visited with one another, ate delicious food and viewed new acquisitions on display. Musicians performed 18th century melodies as over 125 guests filled the house with holiday spirit. Our 2nd Annual outdoor concert was held on a beautiful summer afternoon in August 2016. 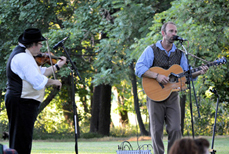 Guests enjoyed tours of the historic Hall followed by a concert in which popular balladeer Charlie Zahm and fiddler Tad Marks entertained the audience in the lovely walnut grove. 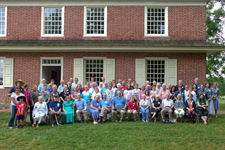 On July 14th, 2012, over 120 Pennock visitors gathered for a day that included genealogy, lectures, memorabilia displays, family history, and camaraderie. This was the first family gathering at the Hall since the mid-1980s and many memories were shared - and created. We were delighted to welcome David Shields, the Associate Director of the Environmental Management Center of the Brandywine Conservancy. David gave us an informative history of the King Ranch, as well as some insights into the Conservancy's remarkable success in preserving this beautiful area for generations to come. The King Ranch is the largest private conservation easement in the United States. Even if you think you know all about it, you'll want to come and learn more! 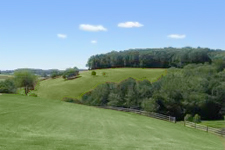 For the Brandywine Conservancy, David oversees, solicits and enforces land conservation easements. Through his important work, he is directly responsible for the permanent protection of over 25,000 acres of our beautiful region. 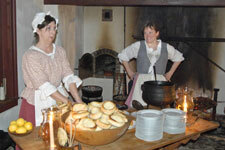 Guests at Primitive Hall experienced a trip back in time at our festive l8th Century Candlelight Dinner. This unique evening was filled with music, dancing, and fine hearth-cooked foods with political philosopher, and future president John Adams in attendance as a passionate speaker and dinner guest. The fundraiser gave us a magical glimpse into the Pennock era. 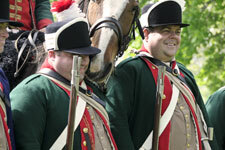 It was 1778 once again when this mounted Pennsylvania regiment pitched camp on the grounds of Primitive Hall in May 2008 and again in May 2009. Our visitors learned about the soldier’s life and lot as the weekend featured mounted drills and cavalry charges, as well as cooking in the field and infantry maneuvers. . . .a revealing look at our historic heritage and colonial roots.